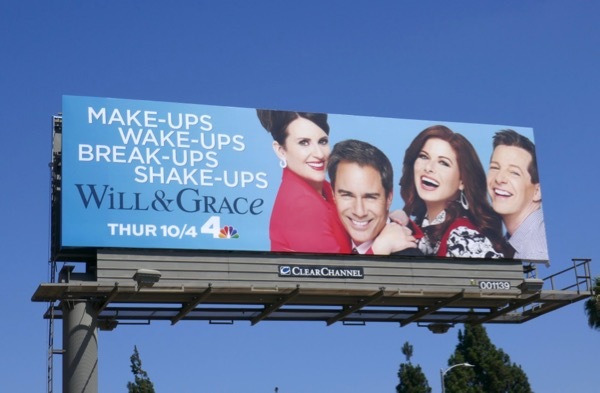 This TV season Will & Grace returns for a triumphant tenth season with the promise of loads of 'make-ups, wake-ups, break-ups and shake-ups'. 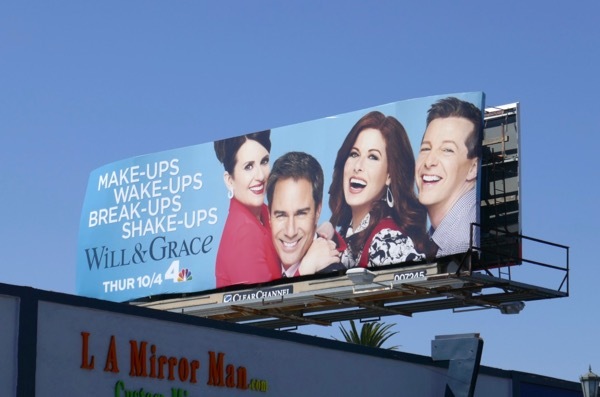 In the words of 'Karen Walker', "Honey, what's this? What's happening? What's going on here?" 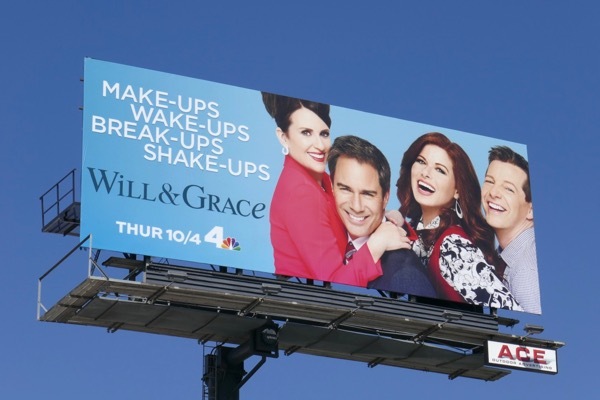 Last September the hit sitcom about a gay lawyer, his interior designer best friend roommate and their funny friends was revived after eleven years, and it turns out it was as if they'd never been away. 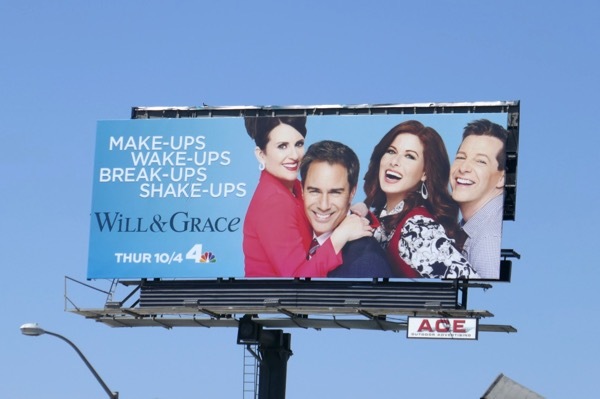 Megan Mullally, Eric McCormack, Debra Messing and Sean Hayes breathed new life into the familiar faces of 'Karen', 'Will', 'Grace' and 'Jack', with the return of old favourites from the previous series and new characters in this slightly hysterical Trump era we live in. 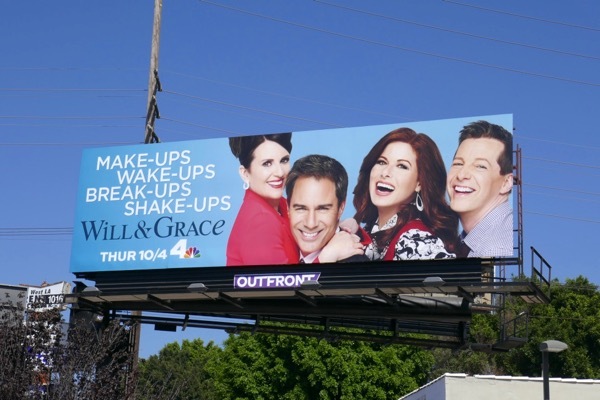 These joyful season ten billboards were spotted along the Sunset Strip, Olympic Boulevard, La Cienega Boulevard and Santa Monica Boulevard from September 6 to September 9, 2018. 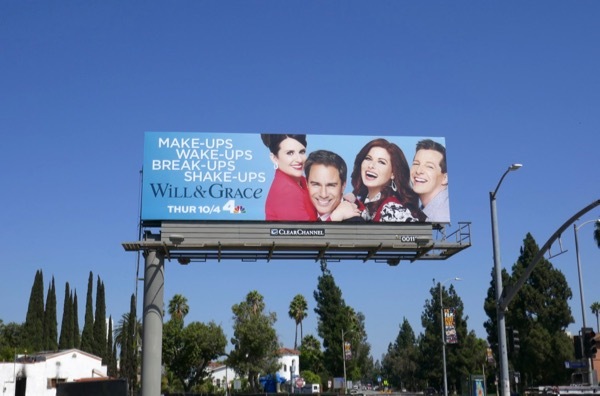 Fans of the hilarious sitcom can also enjoy these season nine and awards consideration billboards for Will & Grace. With this plucky quartet experiencing everything from births to deaths and marriages to divorces the first time around, it'll be interesting to see where their lives go next, but who cares as long as they still make us laugh, because that's what we all really need at this moment in time. And remember honey, "tact is for people who aren't witty enough to be sarcastic".